Just Thinking Harder May Help You Lose Weight : Shots - Health News If you imagine eating lots of M&Ms, scientists have found you won't consume as many real ones when given the chance The results, from a study published in the journal Science, illuminate how our thinking about food influences how much we eat. If you want to eat less, first imagine eating a lot. The notion may be counterintuitive, but researchers at Carnegie Mellon University have found that imagining what we eat before we take the first bite may help us feel less interested in really chowing down. To tease out the effect, psychologist Carey Morewedge and his colleagues recruited about 400 volunteers to try a series of "imagination" tasks. When the thought part of the experiment was done, the volunteers were given bowls of real M&Ms and invited to eat as many as they wanted. 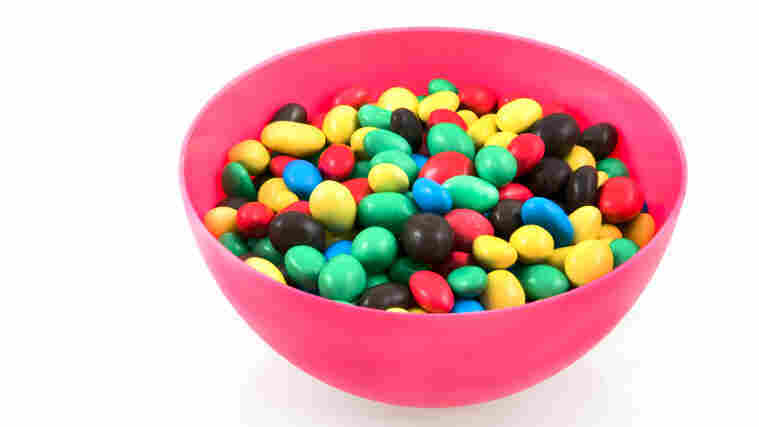 The researchers found that people who just imagined moving M&Ms around ate nearly twice as much those who had fantasized about eating them. The findings were just published in the journal Science. It turns out that there's something about this visualization of eating that confuses our brains. It's as if our minds mistake the mere act of imagining with real consumption. Cornell's David Just, a behavioral economist, has a theory about how it works, "If you start imagining yourself eating the M&Ms your body is actually going to produce some of the dopamine and some of the physical responses to having eaten." So your first real bite can sort of feel like the 30th. The novelty has worn off--and you eat less. Could these findings pave the way for a new dieting strategy? Might we all be able to cut calories by taking up this practice of virtual eating? "I think that would be stretching things a little" just yet, says Suzanne Higgs, a psychologist at the University of Birmingham. But, she adds, it couldn't hurt to investigate more thoroughly "whether this strategy would work for people in their ordinary lives." The brain can be a friend -- or foe -- when it comes to eating. Untangling the many ways that our thinking processes influence our eating habits and appetites has become a hot area of research. Higgs' studies have shown that when people are distracted -- say when they mindlessly munch away as they watch TV -- they tend to eat too much. We're susceptible to all sorts of visual cues that affect our food buying and eating decisions as well. Grocery stores use fancy lighting and eye-catching displays to sway our purchasing decisions towards healthier fruits and veggies.